Huskies call a rather large group of dog breeds (many of which are hunting) belonging to the group of Spitz-like. Despite the fact that representatives of different species are very much different from each other, there are universal rules determine how purebred puppies. First and foremost, before buying a puppy you need to know whether the club binding, that is, whether the dog over time, pedigree. This document is issued in accordance with the rules established in the Russian Kynological Federation, can serve as a guarantee of purity breed dogs. If clubs do not have the necessary license to issue pedigrees sample RKF, the owners of the dog in the future you may encounter some difficulties. For example, even if the puppy will fully correspond to the breed standard, and working qualities will be able to confirm the passage of the relevant tests, the dog will not be able to qualify for prizes at canine exhibitions and participation in pedigree breeding. However, this requirement does not apply to the likes of a number of native species, in particular, Yakut, which was recognized by RKF in 2005, but still did not take its place in the system of UF. Sometimes for breeding are allowed to spend without documents. This is possible in dogs, some breeds in the presence of a number of factors, in particular, because of the exceptionally good exterior or superior working qualities. Most often it occurs in the above-mentioned Yakut Laika or Karelian-Finnish fellow among the livestock of these dogs, the owners of which, as a rule, are experienced hunters, are still cultivated so-called "unplanned" mating, when puppies are not issued any documents. If before purchasing a dog, it turns out that the documents of the puppies there, there are several ways to test the offspring to the purity of the breed. For example, to try to see the father and mother of puppies to evaluate how they meet the standard or other types of huskies. Inexperienced dog breeders could be encouraged to seek the assistance of professionals by inviting a dog or any breeder with you to select a puppy. It should be noted that the owner of the dog, whose puppies were born, the interested in choosing future owners for posterity, will not hide the female. Experienced breeders (in the case of huskies, as a rule, the hunters and real enthusiasts of the breed), not only tells in detail about how to care for a puppy, but you can tell a lot about their own dog, in particular, its working qualities - in fact, the representatives of those breeds, in addition to compliance with the standard, and judged according to their level of "professionalism". In addition to matching the breed standard, if future plans include visits to fairs and participation in breeding, it is important to check the puppy likes (as well as all other breeds) in the presence of so-called disqualifying defects. If a small dog is suffering, for example, cryptorchidism, and albinism or rickets (lack of is fraught with some teeth in adults and abnormal development of joints), or its color does not correspond to the formal parameters, the puppy is unlikely to make a show career or become a well-known manufacturer. Moreover, such dogs, even if you were born as a result of mating pedigree and titled Champions must be sold at a reduced price, and breeder, respecting his name, will tell you about all the nuances. Such dogs, in particular, are ideal for those who just want to have a good friend or helper on the hunt, not trying to visit with him dog training show. Probably will not find the man, who was not cute this incredibly smart, powerful and beautiful dog. Their inquisitive, intelligent face and the tail wheel from warm to everyone. It is not surprising that a lot of people want to have a puppy likesto educate the faithful and reliable friend. To educate puppy huskies should be taken very seriously, because a small animal is helpless and defenseless creature that is able nothing and does not understand. The main task of the owner of the pet remains with education and proper care. Coloring of the muzzle of the dog can be from the ideal black to reddish-brown on a creamy white background. On the head of an adult dog, there are markings that resemble a mask that gives his face provocatively cheerful expression. None of the dogs has such unusual color. 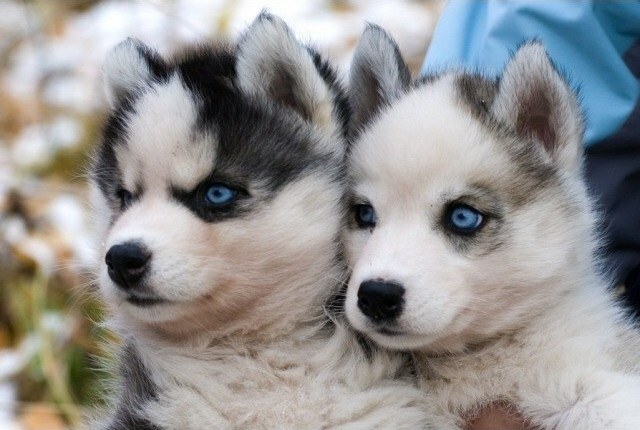 But the most amazing puppy huskies are bright blue eyes. Some dogs have dark brown eyes or amber color, and rare species there are even multi-colored eyes. Powerful paws puppy huskies look like a Shoe because of the rigid and long hair growing between the toes. A specific structure of the legs helps to easily move through dense snow. The pointy ears likes high sticking on top and are next to each other, and a powerful tail very similar to a sickle. Little puppy likes snow will freeze, it is better to start in a house or apartment. For this purpose it is necessary to prepare a permanent place equipped for sleeping and eating. The place must be chosen so that there was no draft and wasn't around heating appliances. The Mat on which sleeping pet, need weekly to be cleaned. It is not necessary to teach your puppy likes going to sleep on the bed or sofa. Over time, this will become a habit, from which it will be impossible to wean. In addition, a playful pet may scratch all the furniture. To accustom the puppy to an independent exit to the street you need to walk him as often as possible. Start doing it from the very first days of stay in the house. If the puppy wants to go to the toilet, he starts to whine and spin, looking for a place. Noticing this, an urgent need to bring it in the yard or in the sandbox. 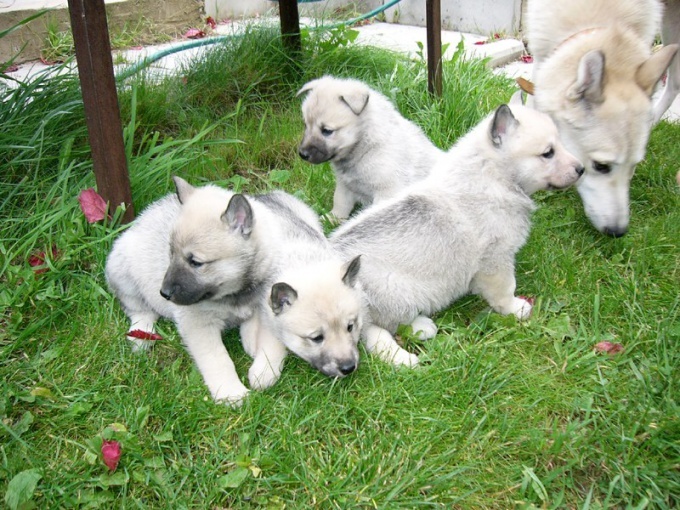 Gradually, you can easily ensure that the puppy huskies have been the one to ask on the street. Special attention in the upbringing of the puppy huskies should be paid to diet. In order to grow strong, well-developed and intelligent dog, feed puppy huskies need nutrients and fresh food with the mandatory addition of vitamins and vegetables. Feeding time should be strictly defined and the puppy needs to eat his entire portion of food. The water in the dish should be changed morning and evening.